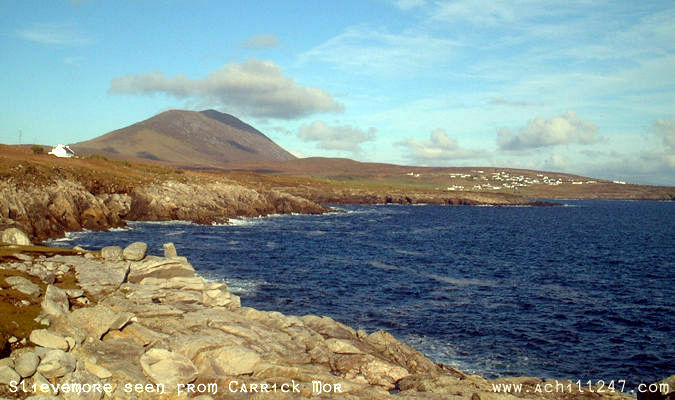 This photograph in Achill 24/7's gallery of Ireland pictures was taken from a point close to Carrick Mor, at the western end of Achill Island. It shows Slievemore mountain, Achill's highest peak at 672m, to the left, and the village of Dooagh (Keelwest) to the right. The English novelist Graham Greene was a frequent visitor to Dooagh in the late 1940s, staying at a holiday cottage in Dooagh with his American mistress Catherine Walston. Irish revolutionary-turned-writer Ernie O'Malley was also a guest at Walston's Dooagh cottage.